Hungarian invader Szilveszter “The Silent Assassin” Kanalas (14-7, 9 KOs) has a plan designed to upset local favorite Nico Hernandez (4-0, 3 KOs), a 2016 Olympic bronze medalist, May 19th in their showdown for the vacant International Boxing Association (IBA) World Flyweight Championship, headlining SUPERBOX LIVE: High Stakes at Kansas Star Arena in Mulvane, Kansas. Hernandez vs. Kanalas will launch Super Channel’s new live boxing series, SUPERBOX LIVE, in association with KO Night Boxing LLC, airing live exclusively in Canada on Super Channel. In the first world championship boxing match ever held in the state of Kansas, Kanalas challenges 22-year-old Hernandez, the reigning IBA Americas champion, in the 12-round main event. 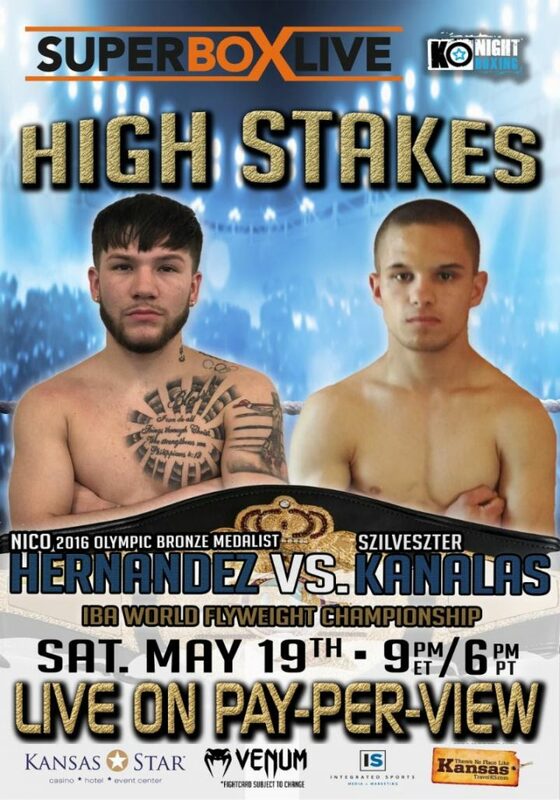 Fighting hometown hero Hernandez in his backyard, where the Wichita fighter made his pro debut last year, apparently doesn’t faze the 19-year-old Kanalas. “I think it’ll be fantastic fighting him in the arena,” Kanalas said. “It will be a good atmosphere for me and Nico. We will both be giving our all. Two years ago, Kanalas became one of the youngest (17) world champions ever, when he defeated fellow Hungarian boxer, Jozsef Ajtai, for the vacant World Boxing Federation (WBF) Super Flyweight World Championship. “I was very happy when I won my first title,” Kanalas remembered. “I thought the world was mine, but life isn’t easy. I had some private life problems and I didn’t prepare enough for my second title fight opportunity for the IBF Youth World title fight in Indonesia. The fight started good for me with two judges giving me the first round, but I got tired and lost in the third round. I’m very happy that I have this title fight and will try to take advantage of this great opportunity. The prestigious list of IBA world champions during the past quarter-centory includes Hall-of-Famers Oscar de la Hoya, George Foreman, Roberto Duran and Arturo Gatti, as well as stars such as Roy Jones, Jr., Bernard Hopkins, Shane Mosely, James Toney, Mikkel Kessler, Eric Morales, Diego Corrales, Jose Luis Castillo, Glen Johnson and Antonio Tarver. Russian heavyweight prospect Andrey Afonin (5-0, 2 KOs) takes on Cuban fighter Pedro “El Reguilete” Rodriguez (23-4, 19 KOs) in a eight-round, In the co-featured event. Afonin was a 2011 Russian Junior Championships gold medalist, while Rodriguez is a former World Boxing Association (WBA) Fedalatin cruiserweight champion. Another heavyweight also fighting on the televised segment of the show is undefeated Ukrainian heavyweight prospect Oleksandr Teslenko (12-0, 10 KOs), fighting out of Toronto, against an opponent to be determined. Undefeated Washington featherweight Victor Morales, Jr. (8-0, 4 KOs) meets David Berna (15-3, 14 KOs), of Hungary, in an eight-round bout. Also fighting on the under, all in four-round bouts, are popular Wichita junior welterweight Jeff Sturm (2-0, 1 KO) vs. Nigeria-native Archie Weah (2-10), Kansas City, KS cruiserweight Chris Harris (2-2-2, 2 KOs) vs. Leroy Jones (2-3, 2 KOs), of Saint Louis (MO), Topeka-, KS welterweight Brian Clements (0-1-1) vs. Nebraska’s Luis Marquez (0-2), and undefeated Texas junior middleweight Joe Alday, Jr. (7-0, 7 KOs).